For those not at school yet or in Reception or Year 1, JAM has lots of things to do in the choir vestry inside church. 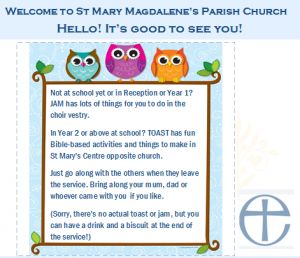 For those in Year 2 or above at school, TOAST has fun Bible-based activities and things to make in St Mary’s Centre opposite church. 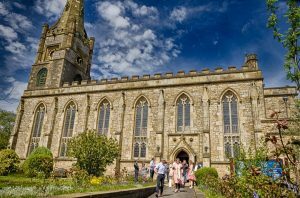 Children are welcome to go along with the others when they leave the service just after the start, and their accompanying adults are able to go with them or stay in church as they wish.